Iowa coach Kirk Ferentz says the Hawkeyes’ slow start is not the fault of quarterback James Vandenberg. The senior has only one touchdown pass through four games and the passing game is averaging 202 yards in a 2-2 start. That’s down more than 30 yards from a year ago. “To just look at the quarterback, which I understand is what everybody does in offensive analysis, it’s not quite as simple as that. I just say this, I’m glad he’s our quarterback. I’m glad he’s gonna be our quarterback the next 8 games. 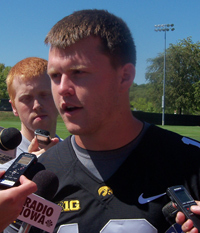 He’s a heck of a quarterback, he’s heck of a young man, “Ferentz says. Ferentz says there are a number of reasons for their slow start. He says it’s more than one position, and he says they have done some things well in the last couple of weeks, and while they’ve had improvement, it has not been enough yet. Ferentz says the Hawkeyes are making progress in some areas, but there is nothing he is satisfied with at this point. “You could say the same about our coaching. We’re 2-2 right now. Real simply, if we had scored 33 the other day, we win. If we had scored, or held Iowa State to 5, we win that game too. So that’s the bottom line,” Ferentz says. The Hawkeyes open the Big Ten race at home against Minnesota on Saturday and Ferentz says this is a better Gopher team than the ones that beat the Hawkeyes the last two years. He says it’s the first time since 2008 that they have started 4-0 and he says the coaching staff has done a great job and the players are playing well. Ferentz is not surprised coach Jerry Kill is getting the Minnesota program turned around. “He’s got a staff that’s been with him for a long time, they do a great job at it…ultimately you get evaluated on how the team plays and to me that’s what it is all about,” Ferentz says.